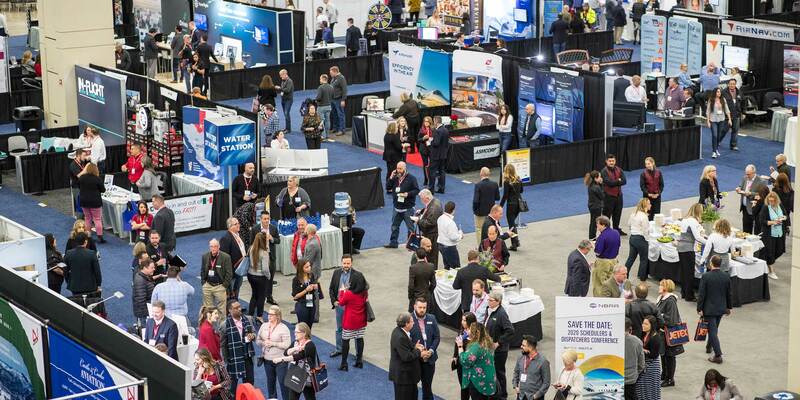 The show floor at SDC 2019 set new records for the conference, both in its nearly 600 exhibitors, and in the area of exhibit space at San Antonio's Henry B. Gonzalez Convention Center. (Photo: Robb Williamson (Williamson Images), courtesy of NBAA). In 1987, corporate flight department members Robert Weinwurzel and Fred Towers had the brainstorm to develop a group within NBAA that dealt primarily with the needs of the flight scheduler and dispatcher community. The pair repeatedly pitched the idea to the organization, which eventually ran with it and elevated it to full committee status. The first Schedulers & Dispatchers Conference (SDC), which attracted less than 100 attendees and a handful of exhibitors to a hotel in Montvale, New Jersey, took place in 1989. Following the traditional first night reception on the exhibit floor, the event began with opening remarks from Mahler and S&D committee co-chair Derek Fitzgerald, a scheduler in Boston Scientific’s flight department. This year marked the first time in the show’s 30-year history where the S&D committee chair position and its show organizational tasks were divided between two individuals, a paradigm that will continue going forward. NBAA president and CEO Ed Bolen announced Kellie Rittenhouse, CAM (certified aviation manager), as the recipient of this year’s Outstanding Achievement and Leadership Award. As director of aviation with Hangar Aviation Management and former S&D committee member who chaired the 2004 conference, Rittenhouse is one of the first in the industry to achieve NBAA’s CAM status. She is also a director of the Michigan Business Aviation Association and was one of the first recipients of the conference’s training scholarship program, which was begun in 1997. Designed to promote the career development of current and aspiring schedulers and dispatchers, the program has awarded more than $700,000 in industry-sponsored cash grants to 170 deserving members since its inception. The money is used for a variety of professional development initiatives. Through a separate S&D Scholarship Training Program, which started in 2004, specific training opportunities are provided by member companies, and 12 such scholarships were awarded this year. Keynote speaker Karen McCullough then gave attendees a perspective on inter-generational changes in the workplace, describing what perspectives those new workforce entrants might bring to their businesses and advising them to listen to those who have different viewpoints. In the Day Two opening session, Louie Gravance entertained the audience with stories of his many years of experience with the Walt Disney Company and how they tied into giving exceptional customer service. Education is one of the pillars of the conference, and this year, showgoers had a slate of 34 sessions to choose from. Augmented and virtual reality, once the stuff of video games, is being developed for pilot training to create fully immersive environments in a compact size. “We think that this is going to increase access to training because these things are going to be lighter and cheaper, more easily deployed,” Purvis explained. “They will be mobile so you will be able to bring training to customers.” Head-up displays in some aircraft will become more wearable, providing overlay information such as airways, weather, and traffic, similarly to how data is presented in the helmets of the latest-generation fighter pilots. For aircraft production and maintenance, technicians will be able to use augmented technology to bring up wiring, cable, and systems diagrams, allowing them work faster and more accurately, to minimize aircraft downtime. Additive technology or “3D printing” is making strides in terms of production, particularly in the rapid prototyping of parts. Purvis expects the technology to soon find a niche in the aircraft completions industry, enabling lighter, customized interiors that are produced more quickly and less expensively. Once the technology evolves to the point where certificated parts can be produced through this method, Purvis sees extreme disruption to the current supply chain model as, theoretically, parts could be made on demand in the hangar, greatly reducing the downtime of aircraft as well as minimizing on-hand parts inventory needs. Electric aircraft, particularly vertical takeoff or landing (E-VTOL) aircraft are currently still in their infancy, Purvis said, with many manufacturers turning their attention to developing passenger-carrying capabilities. According to Purvis, battery weight and capacity remain stumbling blocks at least in terms of creating aircraft with longer legs. In his view, unmanned aerial vehicles (UAVs) will also play a growing role in a variety of applications in the short term, such as cargo transport, firefighting, reconnaissance, and crop and railway inspections. But with the increasing sophistication of the control systems being developed, Purvis can also envision passenger aircraft with one or even no pilots, monitored from ground stations. Boeing’s own autonomous passenger air vehicle (PAV) made its first flight just a week before the conference. James Spadaro, director of sales engineering with business aviation IT solutions provider OneSky Network, described how artificial intelligence will affect the flight-planning arena in a variety of ways, such as route optimization in real time based on changes in weather using predictive analysis; security screening; predictive maintenance, which will aim to address problems before they result in AOG situations; and predictive demand. He then led session attendees on a journey into the cryptocurrency realm, shining light on shadowy concepts from blockchains to bitcoins. While there are currently more than 2,000 different cryptocurrencies, Spadaro believes it will be at least another two decades before they become a generally accepted form of currency worldwide. While aircraft on ground (AOG) is a term no one in an aviation flight department wants to hear, how you recover from that situation is crucial, said Nathan Winkle, founder and CEO of Thoroughbred Aviation and chairman of NBAA’s Maintenance Committee, and Travis Tyler, manager of Textron Aviation’s 1Call Services, in Tech Happens: Recovering from AOG. Outside of FAA safety regulations, AOG in some cases is in the eyes of the user. While it may not affect the performance of the aircraft, a malfunction in the cabin internet connectivity is now generally viewed as enough to ground it, according to some operators. Winkle noted that flight departments should view the possibility of unscheduled maintenance events that could ground the airplane, not as if, but when, and they should plan for the worst-case scenarios and work from there. Departments should have already selected pre-vetted supplemental lift providers, according to Winkle. “It’s not a time to pick a charter out of a hat when you’re AOG: when you’re trying to manage the passengers' expectations, trying to manage your crew’s expectations, trying to manage your maintenance team’s expectations, and you are getting all those phone calls, emails, and texts,” he told the audience. Flight schedulers should even be prepared with a backup in case the first choice is booked, or is down for repair itself. For each trip, you should consider the possibility of an AOG at the destination. Depending on where the flight is going, commonly consumed parts may not be readily available, and operators should consider bringing their own. Winkle stresses that flight departments should establish good relationships, ahead of any possible problems, with their aircraft manufacturer’s field representative, who can be a valuable resource in stressful times, even to schedulers and dispatchers, who may be required to make that first contact in an emergency. “It’s really important to know that when things go awry that you can call those people and they know who you are, and they know what your expectations are,” he said. Once the problem with the aircraft has been assessed, the operator should work with the OEM or repair provider to establish a reasonable return to service time for the aircraft. Tyler, who has dealt with more than 6,000 AOG situations in his career, suggests designating one point of contact with the maintenance provider. Flight department members should develop a checklist of questions to ask the crew on first notification of a broken airplane, he said, so they can quickly gather all the pertinent information to start the process. Trip planning to various parts of the world is always a conference staple, with panel sessions available on operating to: India, Africa and the Middle East; Mexico and South America; Europe; Cuba and the Caribbean; and Asia. In the case of the latter, a general point to consider is that in Asia, business and general aviation is considered low priority behind airlines and cargo flights, according to Leigh Ann Beckett, assistant director of aviation for XCoal Energy & Resources, which operates aircraft in the region. She noted that the wrong attitude can lead to a lengthier process for getting slots and permits and recommends using an international trip planner. She also advised patience in dealing with governmental agencies as things may not move as quickly as in other parts of the world and suggested all communications should be phrased as simply and straightforwardly as possible to avoid any confusion. Sarah Kalmeta, Universal Weather and Aviation’s Asia-Pacific regional director and a member of the Asian Business Aviation Association’s board of governors, said to be skeptical if a local handler says they can do something that an established trip support provider says cannot be done. They may be resorting to illegal means and can bring the operator afoul of compliance regulations. Dovetailing from that session, Fireside’s Chupp led another on ERPs for aircraft accidents, medical emergencies, and mechanical failures. Chupp spent the session discussing ERP development and the importance of continually exercising the plan, which he said can help identify the gaps in it, such as who’s responsible for contacting flight department and corporate staff as well as notifying relatives of corporate and flight department staff. He also urged attendees to get senior leadership of the company involved in such exercises, because those events tend to be eye-opening for leaders and ultimately lead to greater support from the C-suite. In Aviation Emissions: Let’s Clear the Air, Juan Munoz from Universal Weather and Aviation, along with IBAC’s Bruce Parry and Armondo Cairoli from Euro Control focused on the three existing emissions reporting programs: EU ETS, Swiss ETS, and CORSIA. The panelists detailed how they compare and how they differ, and what international operators need to know in order to be in compliance with them, even as reporting deadlines approach. The emissions panel was one of several that were affected by the recent U.S. government shutdown. A representative from the FAA was unable to attend due to his sudden work backlog, along with his CBP counterparts who were unable to participate in the U.S. Customs Key Initiatives panel. Other education sessions covered dealing with weather issues and the differences in operational requirements and regulations between Part 91 and Part 135 flight operations. As customary, the first planning meeting for next year’s conference took place the night SDC 2019 ended. Next year, Schedulers & Dispatchers will visit Charlotte, North Carolina, for the first time. It will also take place later in the year than usual, running from March 10-13, a function of its growing success. “With the scale of the show, it lends us a little bit of challenge as to how we can schedule it,” said Tyler Austin, NBAA’s senior manager for certification and new liaison to the S&D committee. He succeeded Joanne (Jo) Damato, who had served that role since 2004 and was recently promoted to v-p of educational strategy and workforce development. “Opening it up to a different schedule gave us new opportunities to seek out other cities that we’ve never been to before,” Austin said.